Now you can discover how to train your team to score goals like the high scoring Dutch National Team! Dutch Shooting and Finishing is a video series featuring a complete coaching session on turning your team into a goal scoring machine. Discover a complete series of drills for building your team’s familiarity and technique at getting the ball into the box and into the opponent’s goal. Do you dream of having an attacking strike force like the the Dutch National Team with Van Persie and Robben? Forwards who know exactly where to play the ball for other players to run onto and score? The Dutch are renowned for their highly attacking style of play and creativity at getting the ball into the box. Now you can discover how to replicate the way in which they and elite teams train to score goals in this special video series. Dutch Shooting and Finishing features a complete training session focused on building the awareness and familiarity your players need to get the ball into the final third and through on goal. Led by Dutch coach Jan Pruijn, the drills in the video series will develop your players’ passing, ball control, pace and finishing so they can become more potent goal scoring machines. From one touch passing to laying the ball off to crossing and shooting, this video series shows you how to improve your team’s attacking power so you can score more goals and win more games. When watching the elite attacking sides it’s tempting to marvel at their devastating attacking style. You might think that without their technical skills your team will never be able to score goals like they do. But while elite teams are, indeed, blessed with highly skilled players, swift free flowing attacking moves don’t happen by accident. It occurs as a result of players endlessly repeating attacking moves on the practice pitch so they know where to play the ball and where they need to be to receive it. Presented by a coach with international training experience, Dutch Shooting and Finishing provides a complete coaching seminar you can use to develop your team’s attacking prowess so they can terrify opposition defenses and smash the ball into their net more often. In 1985, Jan Pruijn became the coach of De Treffers from Groesbeek, with whom he won the championship in the Zondag Hoofdklasse C league three times. In 1991 Pruijn then joined N.E.C. 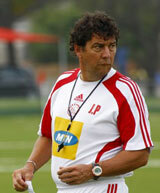 and coached them for three seasons, winning promotion to the Eredivise league and reaching the KNVB Cup Final in 1994. Wishing to broaden his experience, Pruijn took a step into management. His first management role was at his former club De Treffers for a year before spending a season at Helmond Sport. After two seasons as a manager, Pruijn went back into coaching, consulting clubs, including Real Sociedad, FC Porto, FC Basel and some English sides, on how to improve their coaching programs. Pruijn then decided to use his coaching expertise to setup youth camps in the United States, followed by stints as a youth coach in Lebanon and back in Holland, with AFC Ajax, VV Venray and Al Ain FC. During his time at Ajax Pruijn’s coaching talents were used to develop the club’s international youth system, with posts at academies in Ghana, Belgium and South Africa to establish the coaching structure in the ‘Ajax-way’. 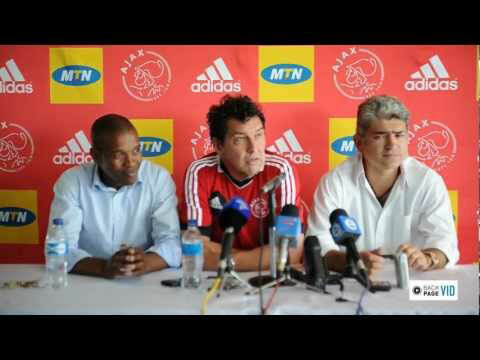 His involvement with the club then led to his current appointment as technical director at Ajax Cape Town, South Africa. Jan carries a full coaching badge from the Royal Dutch Soccer Federation (KNVB), enabling him to coach at any professional level throughout the world. Dutch Shooting and Finishing provides a complete series of drills focused on developing the mindset and technique for getting the ball into dangerous positions around the box. During the session the drills grow in complexity and intensity to make sessions progressively more challenging for players. Pruijn begins the session with a simple warmup. Players have one touch to layoff the ball while the player running in shoots on goal. The drill is then developed with players making square passes to the left or right for an additional player to attack the goal. This progression demonstrates one of Pruijn’s core attacking principles of making three passes before shooting. The session progresses again with players asked to play the ball backwards before it is played into space for attacking players to run onto. This drill helps players to become more aware and familiar with where the ball is going to be played from behind them. Pruijn then adjusts the drill to feature a more obvious example of triangular passing, which is a core feature of a 4-3-3 midfield. The drill also includes passes across the goalmouth to improve reactions and finishing. A defender is also added to raise intensity and the competitiveness. The drill is then progressed to include an additional defender for a 2v2 situation, with one player chasing the attackers and the other running out from the goalmouth. Passing accuracy, consequently, becomes more important, with players running onto a layoff pass before shooting. The session then ends with the ball played out wide before being crossed to the back post, first along the ground and through the air. As with all the previous drills, the focus is on building familiarity with where to play the ball and when to create shooting opportunities and goals. When watching the world’s elite attacking sides it can look as though they are inventing new passing moves with each attack. But the fact is that their creative attacking has been developed through hours of practice on the training pitch. 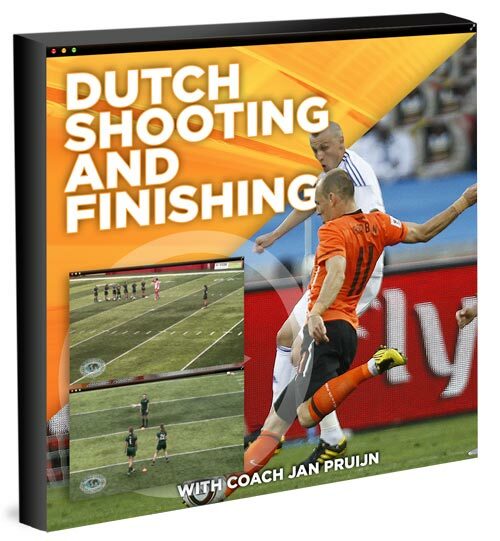 Dutch Shooting and Finishing shows you exactly how to run one of these training sessions so you can develop your players’ familiarity with where to play the ball to create more shots and goals. Any team can improve its goal scoring record through practicing drills which develop familiarity and awareness on where to play the ball to create opportunities. This is why a well drilled side will always defeat a team that may have more technique but doesn’t know how to together. Dutch Shooting and Finishing is packed with insights and drills you need to develop a more effective attacking side that’s mentally equipped to score goals in abundance. WORLD CLASS COACHING is recognized globally for the quality of its soccer coaching resources, which are used by over 40,000 soccer coaches from around the world. 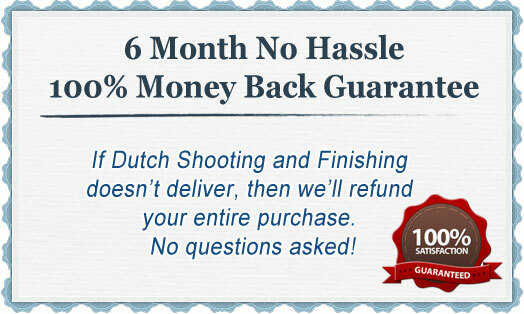 We wouldn’t be offering Dutch Shooting and Finishing unless it achieves our exceptionally high standards. However, if you are not 100% satisfied with the quality of Dutch Shooting and Finishing after six months of implementing its small sided games and exercises then please contact us for a no quibbles refund. Scoring spectacular goals is almost an art form. But it’s one that takes many hours of dedication on the training pitch to perfect. 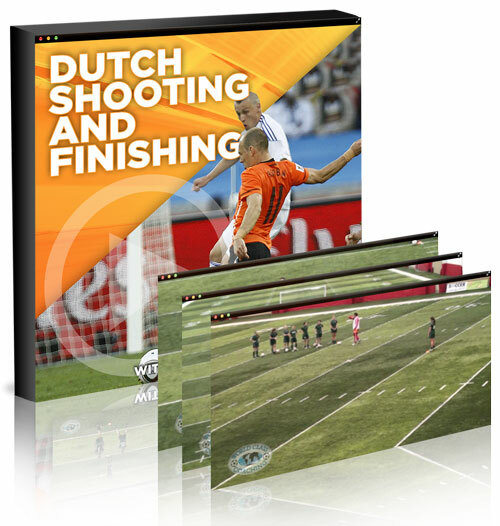 Dutch Shooting and Finishing features a complete seminar focused on scoring goals in the Dutch ‘Total Football’ style of play. Instead of running onto long balls into the box, this video series provides you with drills that use triangular passing moves to get their ball into the penalty area and into the opposition’s net. Along with improving your players’ passing and shooting technique, these drills will develop the awareness and mindset they need to consistently create goal scoring opportunities. So if your team lacks the cutting edge to get into the area, look no further. Dutch Shooting and Finishing provides you with the complete training session you need to create goal scoring chances in abundance and a team that will delight the crowd with its creativity and highly attacking style of play. P.S. Dutch Shooting and Finishing is a video series which features a complete coaching seminar on developing your team into a goal scoring machine. It features a series of progressive drills which will improve your team’s passing, situational awareness and shooting so your team can create more scoring opportunities and push the score line in your favor. P.P.S If you are not 100% satisfied with the quality of the soccer coaching resources in Dutch Shooting and Finishing after six months then we will refund your purchase in full, no questions asked. One last thing. If you are an Elite Member, these videos are included as part of your subscription so there is no need to purchase them here. Just log in to the WCC TC and click the Video Library and do a Keyword search for “Pruijn”. If you are not a subscriber to the WCC Video Library, check it out here as you can have access to these videos and hundreds of others for one low price instead of paying separately for each set of videos.